1990 Sands Regency Classic XII . Dec. 9, 1990 . Reno, Nev.
As Kim Davenport drew the cue ball back from the 7 for perfect shape on the 9, he slid his cue on the table and did a little shimmy - complete with a pair of finger guns in the air. He momentarily regained his composure and slid the 9 in the corner pocket, then went back to celebration mode. "Six years I've been waiting for this!" he screamed. 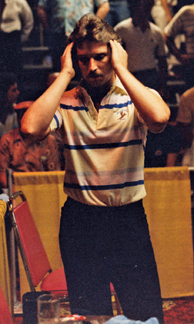 In the final of the 1990 Sands Regency Classic in Reno, Nev., Davenport exorcized the runner-up demons in a brilliant display of finesse against Earl Strickland. Since the twice-annual Reno Open began in 1985, Davenport finished second three times, once to Strickland and twice to Nick Varner. This time, though, Davenport proved resilient in the tournament that would give him 1990 Player-of-the-Year honors. The final, a best of three race-to-9 sets, was the coronation for a man who'd been oh-so-close too many times. "This was a big win for me," Davenport said. "I've been second here three times, plus it was my third win of the year." Entering the last major event of the year, three players had realistic hopes of being the POY. Runner-up Strickland had two Men's Professional Billiard Association titles and the World Championship in his back pocket. Allen Hopkins also had two MPBA titles of his own. All three of the contenders advanced to the final four. With a 11-8 win over Hopkins in the fourth-place match, Strickland thought he had done enough to nab POY honors. Davenport tried not to think of his losing streak. "That was a key match," he told Billy Incardona. "But Billiards Digest has already named me player of the year." Not exactly. In fact, not at all. The confident Strickland then dispatched Buddy Hall in the losers-side final to meet a relatively untested Davenport in the final. Running through the winners' side, Davenport benefited from a rash of upsets. He faced only one MPBA top-20 ranked player before he topped Hall in the hot-seat match. But the final would be a true test. Davenport took the first set, 9-7, while Strickland was issued a warning for repeated temper tantrums. The Pearl responded, taking the next set 9-7. The do-or-die third set started well enough for Davenport, who broke and ran the first rack. But Strickland would clean up the next game, then rattle off three more to lead, 4-1. Strickland missed a 2-9 combo in the sixth game, at which point he might as well have retired. Davenport took that rack, then the next, and the next, and so on until he was primed for "The Davenport Shuffle," as Buddy Hall called his celebration dance. In all, Strickland had only two more shots, both ineffective safes, in the final eight games. Davenport had six break-and-runs. With the albatross lifted, Davenport reflected on his string of runner-ups. "I was beginning to wonder if I'd ever win," he said, "although I tried not to think about that when I was playing."